Doors & Windows is the companion EP and first single from Monstrum Sepsis' critically acclaimed full length album, Deep Sea Creatures. 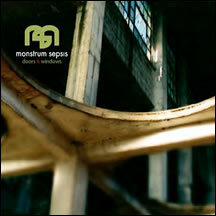 Led by Rob Wentz and Paul Karlik, Monstrum Sepsis' unique blend of pulsing synthetics, erupting modulations and infectious rhythms have been modified and manipulated by the likes of Haujobb, Displacer, Android Lust, Mimetic, I,Parasite and more. In addition to the remixes, Doors & Windows included five previously unreleased tracks. Overall this eleven track EP plays more like a full length and comes in digipack format.